Lynn and I broke camp slowly and said goodbye right around noon. Leaving Sisters I headed towards McKenzie Pass, which is the last big climb of my ride. The way up and over the pass wasn't too steep compared to what I've already done, but today felt like the coldest day I've ridden in to date. As I kept climbing through the afternoon I kept adding layers, until I was wearing just about my entire cycling wardrobe. 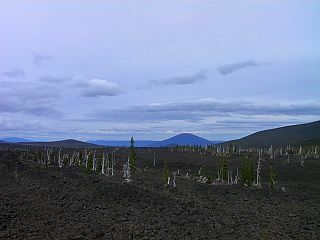 As I ascended the landscape slowly changed from pine forest to barren lava beds. The Cascades contain over 100 volcanic peaks, and the lava flows at the top of McKenzie Pass are believed to be among the most recent in the United States. Instead of the ordered regularity of trees standing shoulder to shoulder, the lava was a field of chaos where a handful of pines struggled to set root into the ground. Without the benefit of trees to break the wind, I was nearly shivering from the cold as I finally crested the hill. The weather and terrain changed rapidly as I headed down the other side, as the lushness I had expected from Oregon finally showed itself. Pine gave way to fir and cedar, and sagebrush finally yielded to moss and ferns. The road itself was a cyclist's dream, twisting and turning enough to be interesting, and so densely lined with trees it was once again like riding in a green tunnel. 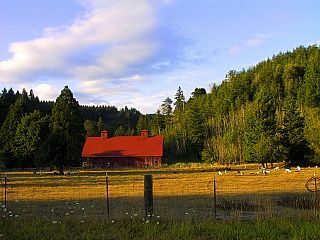 My intention had been to stop and camp at the town of McKenzie Bridge, but another cyclist had recommended heading another twenty miles west and staying at an Oregon State Park. But his directions had been vague, and I found no place to stay where he had suggested. Unfortunately, by passing my intended spot I had left the final campgrounds before Eugene far behind. I decided to make an all or nothing push to Eugene, even though it would make for a late ride. I made it to Eugene about two hours after sunset, and checked myself into the Hostel here. With the nearly one-hundred mile day I made today, I'll probably be reaching Florence tomorrow. It has been over three months since I started this journey and although I have mixed feelings about ending it, I'm ready to give standing still a try. You are an inspiration! Your feat serves as an example of what one can accomplish if they would only dream and, with determination, work to make their dreams reality. Dip that front wheel in the Pacific and celebrate. You deserve it!!! And oh yes, dream on and from the bottom of my heart I pray that your journeys will take you to where you need to go. Thank you for the gift of your journal!! There is no other way to descibe it than "EXCELLENT". It was not easy hauling all that extra weight. I know after a long day riding, it took a lot of time and energy to keep it up - besides all of the Email. But you will never know the extent of the gift you have given and the inspiration that you inparted by sharing your journey. Congratulations! It is great to look at your website! it makes us going back there!!.... Yes, we are today back to our first day of work.... sitting the day long... life goes on, but we are waiting yet for our next bike tripl! Have a nice rest! It was nice to meet you! Congratulations on reaching Eugene which was to be my destination until I decided to finish my trip in Missoula. I have enjoyed your web site. Continue your good work and stay in touch. Take a good rest, you've earned it. And if you feel like it come back to Reno and stay awhile, your always welcome. As one who is following westward, I've periodically looked at your site to see what I'll be up against. It has always been interesting and well written. My '01 Randonee had 4 broken spokes before I had the wheel rebuilt. Sound familiar? May you always keep that peace you found out there (OK except when morons in Trucks want to flex their dinosaur guzzlers). Man, I sure was hoping the Hornish was going to win the Indy 500.
reflects the cultural assumptions of that age, not of the age in which the tale is set.